The first ‘mausoleum’ was built around 475, most likely commissioned by StE Geneviève, who was particularly devoted to Saint Denis. The development of a necropolis led to the expansion of the church in the 6th and 7th centuries. Numerous Frankish aristocrats, women for the most part, were buried as close as possible to the saint. The discovery, in 1959, of a sarcophagus containing the remains of Queen Arégonde, Clovis’s daughter-in-law, who died in the second half of the 6th century, provides evidence of the sanctuary’s power of attraction. 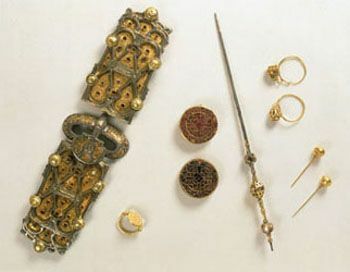 The jewels found in the tomb are in the collection of the Louvre. 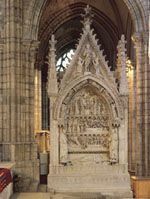 50 years after Arégonde’s death, in 639, King Dagobert became the first Frankish king to be buried in Saint-Denis Basilica. Certain Merovingians and Carolingians were also laid to rest there, in particular Charles Martel, Pépin the Short and Charles the Bald. King Dagobert distinguished himself by making generous donations to the abbey, and legend has it that he created the Saint-Denis fair that was held each October and was a source of great wealth for the monastery. Pépin the Short, the son of Charles Martel, was anointed by Pope Stephen II at Saint-Denis in July 754, sealing the alliance between the Frankish kings and the papacy. He was the first sovereign to be crowned as the image of God on earth. This great king then had the church rebuilt along the lines of the Roman buildings known as basilicas. Featuring a wooden roof and dozens of marble columns, it was decorated with thousands of oil lamps. A crypt was added for the first time and, until the 12th century, it housed the relics of Saint Denis. The vestiges of that Roman-style martyry with paintwork imitating marble can still be seen today.